Ciao a tutti! Boy, it's getting warm here in northeastern Australia. It was about 40C yesterday. Summer is fast approaching! It means I'm sweating my bum off, but it also means I have lots of bright sunlight for showing you the third review item Born Pretty Store sent me: these beautiful dragonfly charms! The charms are about 1.5cm across the wingspan, and 1.7 from the top of the pearl to the end of the diamante tail. They are thin and delicate, but still seem well-made. 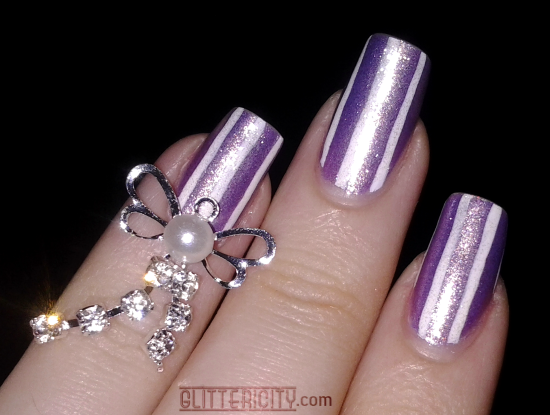 The tail is free-swinging, and I was able to bend the wings gently to fit more around my nail. I wouldn't recommend doing this very much, because I think they would break off eventually. I didn't realise they had the little loop on top when I saw them on the website. I think I will actually wear these more often by attaching a hook and wearing them as earrings! Because as gorgeous as they would be for a special occasion, they are a bit on the large side for everyday wear on the nail. I feel so pretty and dainty with these on! Makes me want to attend a wedding or fancy dinner. It would certainly be a conversation-starter! 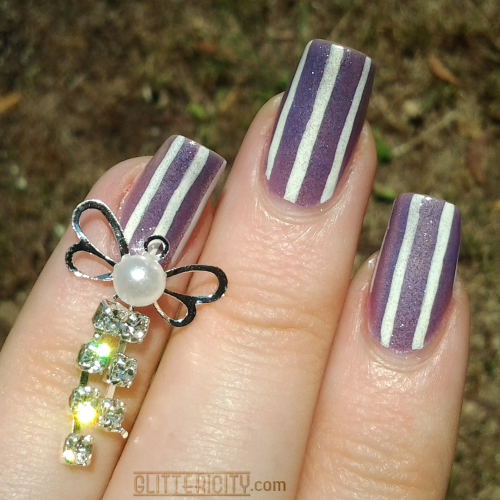 You can find these charms here, as well as so many other beautiful nail art supplies. As usual, don't forget to apply discount code CITYG10 for 10% off any order! That shimmery lavender is so pretty!!! Isn't it wonderful? Zoya makes the absolute best shimmers. It should still be available at Ulta if you want to have a look for it!